As I mentioned in my previous post, April is full of birthdays and anniversaries. Last weekend we celebrated my hubby’s mama’s 77th birthday. I baked a cake for his birthday. It had to be eggless as mamaji is a total vegetarian, no eggs or meat or fish. I had loads of over ripe bananas and thought of using them up. Hot weather means bananas do not stay good for too long. I though of using butter icing and then changed my mind as I thought a 77 year old man deserves a more classy cake. He wanted to serve ice cream as dessert so mamiji requested for a cake that could be served with ice cream. I decided to drizzle the cake with some chocolate ganache. I am so glad I did that. My butter icing would have melted in the heat. That day was just too humid even in the evening. Mamaji at 77 is still full of energy. He loves his food, and he thoroughly enjoyed all the old hindi songs that were selected and some of the guests sang for him. Both mamaji and mamiji love entertaining people. It was a fun get together. Makes me wonder if I will still be full of energy and life when I reach that age or for that matter when I reach 60. Everyone keeps on saying that age is but a number.. so lets see how well I age.Body changes, takes place in all of us, just some age faster than others. In the meantime will keep on doing things I enjoy the most which includes blogging and cooking. Here is the recipe for the cake. Grease a bundt pan with butter and dust it with plain flour. Sift flour, cocoa, soda bicarbonate and salt together into a bowl. Add walnuts and orange zest.Mix well. Take another bowl and add mashed banana, hot water, orange juice, sugar and melted butter to it. Add the flour mixture to the liquid mixture and mix just enough till the flour is wet. Do not over mix. The batter will be liquidy. Place it in the oven and bake for 45 -60 minutes or until its done. Insert a skewer into the cake. If it comes out clean the cake is done. Remove the cake from the pan and place it on a wire rack to let it cool completely. Heat chocolate and cream in a pan over low heat. Stir till the chocolate melts. Make sure the mixture does not boil, so maintain low heat. Once the chocolate is melted add the cocoa powder and mix well. Let the ganache cool down. On cooling the ganache will become thick. I left it in the fridge for a 1 hour. If the ganache becomes too thick, add a bit of milk and mix. Start adding a tablespoon full. Drizzle the ganache over the cake. Decorate as you wish. Serve the leftover ganache with the cake. You can bake the cake in two 8″ sandwich tins or a 10 -12″ round tin. You can serve the cake without the ganache. You can use oil instead of melted butter. Grease and dust the pan well, don’t forget the pipe bit. You can make ganache with just cream and chocolate add more chocolate. Perfectly baked cake n Yummy luking frosting. Nicely decorated cake and lovely clicks. 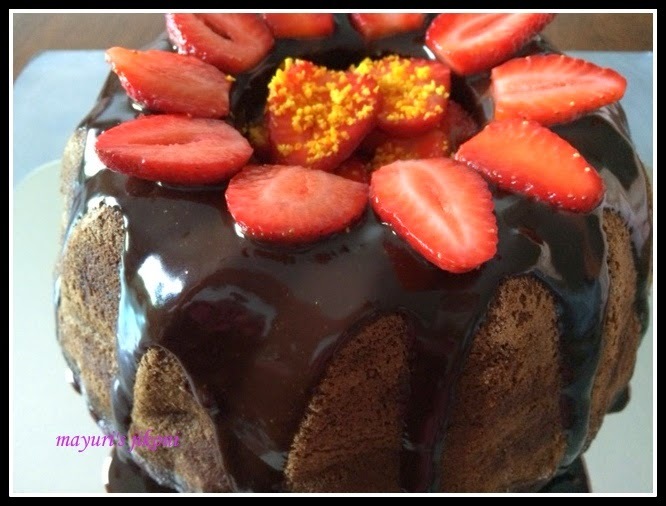 Bundt banana eggless cake looks so soft and the ganache is so very delicious! Thanks for all your lovely entries for my anniversary event..I enjoyed reading through all of them!